To say we've got the travel bug is an understatement. Our Insta feeds are littered with wanderlust, and we pretty much only save to travel. Renting is fine with us if it means we get to see the world, let's be real. But, it can be hard to travel on the same timeline as your S/O or mates—someone's always out of annual leave, and we all have that one friend who just can't save their money. That's why we've teamed up with the small group travel experts Flight Centre to let you in on all of the untouched South American spots you need to add to your bucket list right now. With more than 30 years' experience, they understand you don’t relish the thought of sharing a bus with 60 hungover teenagers (ummm, no thanks) so they’ve partnered with Intrepid and Peregrine, which offer a bunch of itineraries that not only venture to some of the world’s most awe-inspiring locations, but are lead by locals and limited to 16 people per trip. They are also big on responsible and sustainable travel (same) along with making sure each member of their groups receives personalised firsthand travel experience to enjoy themselves while still positively contributing to the local communities they encounter. Flight Centre are currently having a huge sale where you can score 10% off amazing Intrepid and Peregine small group journeys through Latin America. Book between 25 October and 21 November, 2018 and they'll also send you a $300 Canon voucher to put towards a new camera and/or lens - because you'll want to take alllll the photos on these trips. Now, we know you're down for that! Arguably one of the most remote and visually stunning places in the world, Patagonia is at the southern most tip of South America, and is technically shared by Argentina and Chile. This place is all about the breathtaking mountains, vast ice fields and glaciers—there’s almost too much for your eyeballs to take in here (in a good way). We suggest you start with hiking glaciers, trekking through the iconic Torres del Paine National Park and taking in fresh air like you’ve never experienced before in your life. Cue digital detox. If Machu Picchu isn’t on your hit list yet, it needs to be. And easily the best way to see this UNESCO World Heritage site is travelling with a group, and ideally, a guide too. The classic route is to start in Cusco, travel through the Sacred Valley, to the ruins of Ollantaytambo and finish with the life-changing trek to Machu Picchu. And let’s just say, it’s a bucket list item for a reason. We know you’ll all be chomping at the bit to get that winning 'Gram shot, and you definitely will, but the sacred Inca Trail is about so much more than that. 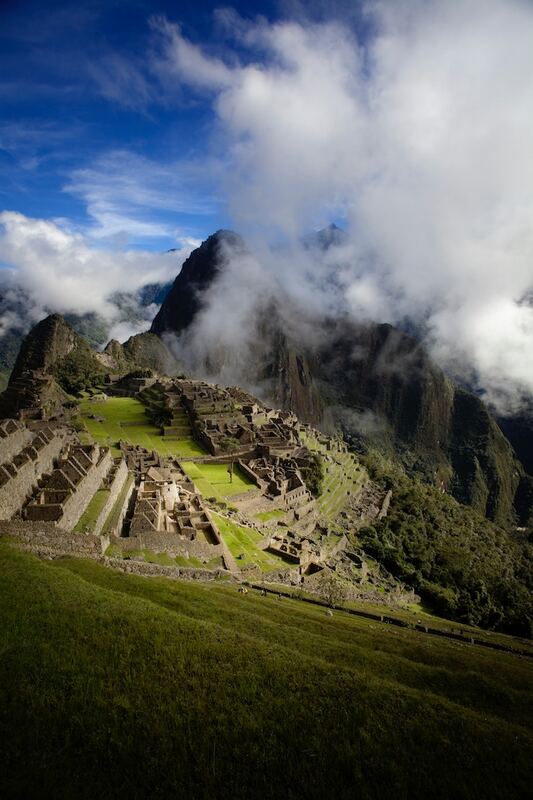 Plus, watching the sun rise over Machu Picchu might just be the most magical moment of your life. Another UNESCO World Heritage site to add to your bucket list, the Galapagos Islands are a cluster of 19 volcanic islands sitting on the equator in the Pacific Ocean. They are teeming with history, incredible wildlife, and are known for their crystal clear blue waters, boasting one of the world’s richest varieties of marine life. Holding the title as a living wildlife museum, this is also where Charles Darwin developed his theory of evolution and natural selection and we suggest you play explorer yourself when you head here (which you obviously will). If you’ve considered all of your South American options and you’re yet to find the balance between a pumping party, an overdose on breathtaking nature (we’re pretty sure that’s not actually a thing), and hourly cultural experiences, listen up. We know we’re semi-cheating by including Argentina and Brazil together, but we just don’t think you can do one without the other. From Buenos Aires to Rio de Janeiro, Iguazu Falls and the Amazon Rainforest, you will tick them all off while dancing the samba and drinking Malbec wine or caipirinhas (or both). Editor’s note: This article is sponsored by Flight Centre and proudly endorsed by The Urban List. Thank you for supporting the sponsors who make The Urban List possible. Click here for more information on our editorial policy.